In Lee’s Summit, Missouri, one of the state’s “Top 10 Happiest Places,” you will find remarkable real estate options in a plethora of distinct neighborhoods and subdivisions. As the sixth largest city in the Kansas City Metro area, Lee’s Summit affords its residents a charming, laid-back lifestyle with quick and convenient access to all the exciting attractions of the big city. One of Lee’s Summit’s most renowned communities is that of Park Ridge. Park Ridge is comprised of multiple smaller communities including Park Ridge Manor, Park Ridge Meadows, Park Ridge Summit and the Trails of Park Ridge. The Trails of Park Ridge have many luxurious homes for sale and recently a new phase of maintenance-provided home sites opened in the development known as Tranquility at the Trails of Park Ridge. This new phase includes 29 maintenance provided home sites and nine inventory homes. The prestigious Park Ridge community is located just east of Highways 470 and 291 on Woods Chapel Road. Because of its strategic location and easy access to major highways, it is easy for Trails of Park Ridge residents to reach any destination in the Kansas City Metro area within minutes. Trails of Park Ridge is a great place for retirees, young professionals and families. 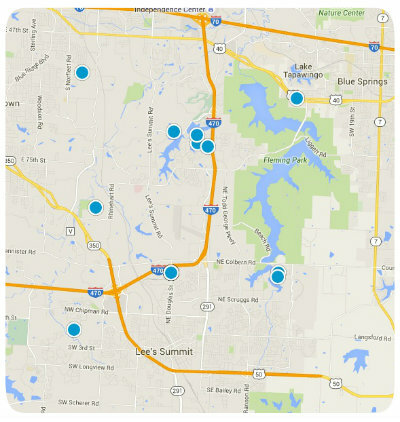 Students in this splendid community are served by the highly rated Blue Springs School District. Buy a home in Trails of Park Ridge and enjoy all of the wonderful community amenities including a fitness center, walking trails, a swimming pool, clubhouse and tennis court. Homes in Park Ridge are constructed by the best builders in the area and have a median listing price around $394,949, or $115 per square foot. If you would like to buy a home or have one built in the master-planned community of Trails of Park Ridge in Lee’s Summit, Missouri, please do not hesitate to contact us today. Listing courtesy of Amber Shawhan of Chartwell Realty LLC. Another custom "The Richardson" by McGraw Homes. This one is sold, but we can build you another one!